Probing fossil DNA for the genetic information of a long-extinct species might sound like a feat fit for Hollywood. For two research teams, however, the stunt is starting to become reality, as they have begun to unravel the genetic code of Neanderthals  a close, yet extinct, relative of modern humans. Vindija cave in Croatia (pictured right) kept a 38,000-year-old Neanderthal fossil relatively free from human and biological contamination. Researchers extracted DNA from the fossil to begin mapping the Neanderthal genome. Image is courtesy of Johannes Krause/Max Planck Institute for Evolutionary Anthropology. Previously, researchers were limited to studying Neanderthals by examining archaeological remains and the fossil record, which revealed information such as body structure and migration routes. By the late 1990s, researchers had the tools to begin looking at Neanderthal biology by looking at its DNA. Such research was limited, however, to DNA contributions from the mother  known as mitochondrial DNA  which could tell them about connections between species and where they came from, but not the entire genetic picture. Now, two groups publishing separate papers this week in Science and Nature say that advances in technology have allowed them to test nuclear DNA, which tells them about the biology of Neanderthals, and when the ancestors of Neanderthals and humans diverged. When researchers sequence DNA, they are looking to determine the order of the chemical building blocks of DNA, called base pairs, which can tell researchers how their subjects live, survive and reproduce. The Human Genome Project, for example, sequenced the 3 billion base pairs in human DNA. The technique is possible for fossil DNA too, and has been used on extinct animals such as cave bears and woolly mammoths (see Geotimes, May 2006). But fossilized Neanderthal DNA has the potential to reveal connections between humans and their Neanderthal relatives, and how Neanderthal biology has changed over time. "Most people like the Neanderthal because that says something about us," says Hendrik Poinar, a paleogeneticist from McMaster University, not associated with either study. To begin sequencing Neanderthal DNA, the teams first had to find suitable Neanderthal fossils that were relatively free from human and bacteria contamination  something that's exceedingly hard to find. The teams chose to use DNA pulled from a 38,000-year-old Neanderthal femur found in a cave in Croatia. The bone itself is "rather small and uninteresting," says Svante Pääbo of the Max Planck Institute for Evolutionary Anthropology, and part of the team publishing in Nature. But the bone's insignificance was "fortunate," he says, as it had been "thrown in a big box and not handled much by humans." 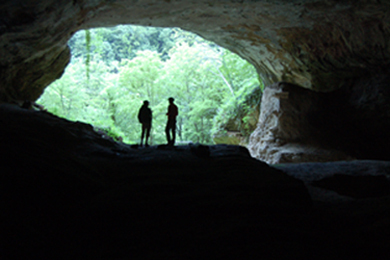 Armed with Neanderthal DNA, the two teams set out with two different study approaches. Richard Green of the Max Planck Institute for Evolutionary Anthropology, who headed the Nature study, used a new technique called pyrosequencing, which sequences the DNA directly and increases the amount of DNA processed by about 100 times when compared to traditional methods, according to David Lambert and Craig Millar in a News and Views story this week in Science. With this technology, the team sequenced more than 1 million base pairs of the nuclear DNA. Meanwhile, James Noonan of Lawrence Berkeley National Laboratory, who headed the study published in Science, stuck with a more classical method called metagenomics, and sequenced 65,000 base pairs of Neanderthal DNA. Although this method is slower than pyrosequencing, the team can target specific sequences of interest, says Edward Rubin of Lawrence Berkeley National Laboratory, who worked with the team. The teams next used their sequenced Neanderthal DNA and compared it to existing chimpanzee and human DNA. That information, along with estimated genetic mutation rates and the sizes of early populations gleaned from other research, allowed the teams to estimate the time at which the ancestors of humans and Neanderthals split. Green's group arrived at an average divergence time of about 500,000 years ago, whereas Noonan's team placed the split at about 370,000 years ago. As more sequences are performed, however, those numbers could "come together," Rubin says, as both studies account for only a small portion of the approximately 3 billion base pairs in the Neanderthal genome. And so far, Rubin says that researchers have not seen any evidence of "mixing" between Neanderthals and humans, although the "data does not exclude it." Noonan's group's more classical method is "probably more solid," Poinar says, but he says that the method used by Green and colleagues is the "way forward," due to the large portion of the genome remaining to be sequenced. Both studies, however, are a "proof of principle," he says, addressing how to deal with the ever-present issue of contamination. Identifying specific genes of interest, however, such as those that determine skin color and language skills, is still likely "several years down the road," he says.